With a brisk SW breeze and bright sunshine, club members enjoyed two separate organised dives this Sunday. 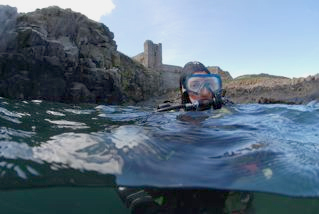 One group, Mike, Maurice, Simon and Nicola opted for a shore dive off Howick. This exercise involved something of a hike carrying their dive equipment down to the shoreline, but had the advantage of a later start. For the remainder, Richard, Andy, Fiona and Mark, who opted for a boat dive, it meant an early start, but the freedom of a greater range of dive sites. Launching from Beadnel, the RIB headed south down the coast towards a series of reefs off Embleton. Here we resumed the search for the wreck of the SS Ballycotton. 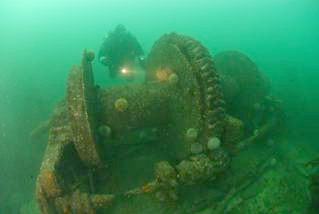 Two previous searches had succeeded in locating a large riveted plate, evidence that the wreck lay somewhere nearby! With only one area of the reef remaining to be searched, we were quietly confident that this time we would find the wreck. Within minutes of arriving on site we picked up a clear image of the boiler and other wreck debris on the sidescan. Richard and Fiona dived first, and confirmed that the Ballycotton had indeed been located. The SS Ballycotton was an 888 ton steamship built in 1899. She was wrecked on the 15 th February 1900 whilst on passage from Amsterdam to Grangemouth. Today her wreckage lays well dispersed around the seabed close to the base of the reef upon which she was wrecked. Her single boiler lies in around 7 metres of water. Nearby can also be found a large deck winch. 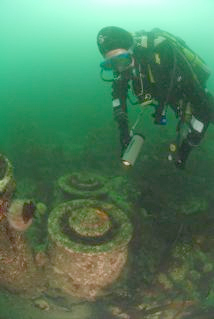 All around the areas, other debris from the wreck can be found, such as girders, and hull plates. 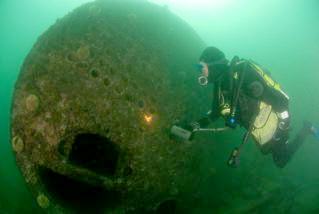 The SS Ballycotton nevertheless still provides an interesting rummage dive in shallow water. Its exposed position out from the shore however does ensure that a noticeable tidal current flows across the site. 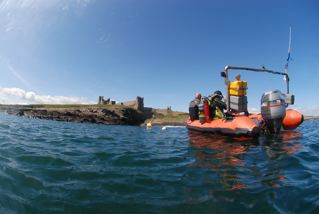 For the final dive of the day we opted to dive off Dunstanborough Castle . The imposing ruins of this castle provide a dramatic sight along this area of coastline. It is rumoured that an ancient harbour, built to supply the castle, lies under the sea. Underwater we came across scenic gully’s with plenty of marine life, but no sign of any other man made structures. It nevertheless provided an interesting scenic dive in a dramatic setting.